Star Cinema releases trailer of their first movie offering this 2017 - Extra Service. Starring three of Kapamilya rising drama princesses - Coleen Garcia, Jessy Mendiola and Arci Muñoz as Aw, Em and Gee respectively, Extra Service is an action comedy film reminiscent of Hollywood's Charlie's Angels. The Pinoy Charlie's Angels are paired with Ejay Falcon and new Kapamilya recruits Enzo Pineda and Vin Abrenica. Pineda rose to fame with GMA's StarStruck while Abrenica is a former Kapatid talent. 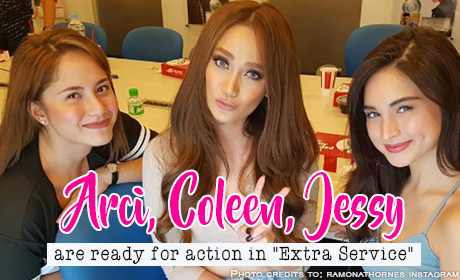 Directed by Chris Martinez, Extra Service is a co-production of Star Cinema and Skylight Films. The movie will open in cinemas starting January 11, 2017.